Pool Tables Here: An Ultimate Review Of The Most Popular Models In The US! Pool is one of the most popular men’s games. And there are a lot of women who play it quite well too. Pool championships gather millions of fans in front of TVs and computer monitors. But watching is not as cool as playing. There are many bars and pool clubs where you can come and show how awesome you are when holding a cue in your hand. However, nothing compares to your own table at home, where you can play pool any time you want with any partner and improve your skills every weekend (or even every night). It can be a great opportunity to gather family members and friends, to have an excellent time playing. 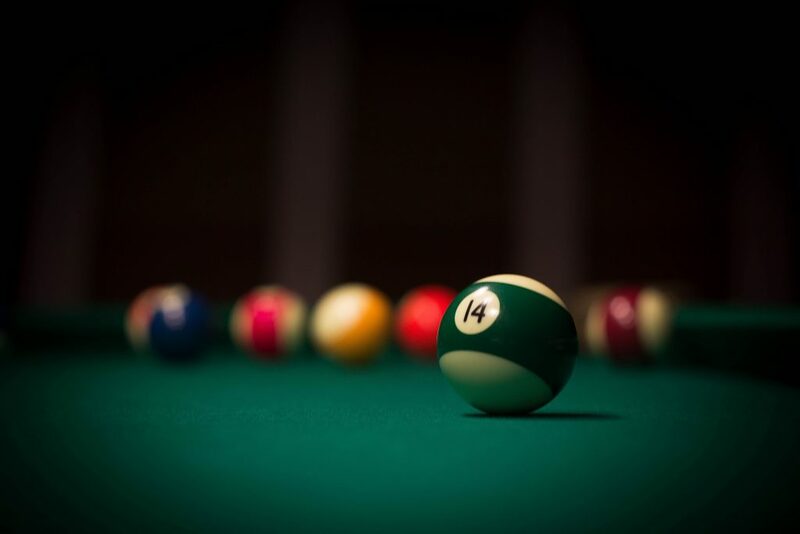 Basically, there are a few questions, which require your answers before you begin to search for a perfect billiard table. A price is the first one. In this case you get indeed what you pay for. Brand matters less, more depends on design and materials. So determine your budget for this purchase and prepare to choose the best pool table for the price. The second is room. It is quite important what size space you have to position your new entertaining stuff. Would it be comfortable to walk around it in order to indicate the best way for taking aim? And the last one is about your personal preferences. On this step just consider how often and how seriously are you going to play? Are you going to make Fan Yang and Mick Hill losers at Pool Championship? Or you just want to have fun with your friends on Saturday nights? After you answer the questions above, you may review and compare the features of the different models, define advantages and disadvantages, and, finally,make a choice which will never u disappoint you. Seems to be a pretty hard task, ha? Actually, I have done the most part for you. 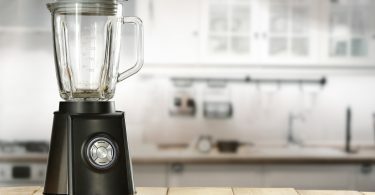 In this review you will learn what features you should pay attention to and what models are worth buying. Pool table beds can be made of wood or slate. Some manufacturers use also plastic but I won’t recommend that. Most experts suggest the bed being made from slate. Professional tables, which you may normally see on the championships, as well as in pool halls, pubs and bars, all are made from slate. However, you may find that the best value pool table has a wooden bed. They are considered to be cheaper and not so elegant. Additionally, their surface is not so smooth and this may affect the roll of the ball. Although all these arguments often are very close to the truth, I played on a few wooden billiard tables and was satisfied. Anyway, all depends on the quality of materials and the quality of work. Well, the cloth for billiard tables is not as important as the bed with its playing surface. However, it also worth attention before the choice is made. There are two main types of the billiard cloth: woolen and worsted. Basically, it doesn’t matter what type you prefer, the roll will be good on both of them. But there exists a little difference you should be aware of. For example, worsted cloth is used within most pool halls and pubs. It is made from sheep wool and has non-detectable nap (it means that it is non-directional and you won’t find any handprints on the table after touching). It is widely appreciated because it makes ball hitting fast, strong, precise, and smooth. Woolen cloth is normally used at competitions and championships. It features “directional” covering, so it can slightly affect the ball’s roll and show hand prints after hit is made (remember watching championships on TV?). This type also needs to be brushed and maintained a bit more often than a worsted one. If you are looking for a home pool table, both types are fine. They will be good-looking and durable. But for your moneybag friends you’d better choose woolen cloth to make a great impression. This is the least you should worry about. Normally, billiard tables based on a slate bed come ad-hoc with high-quality rubber cushion or rail. However, there is one thing you have to look at. I’m talking about cushion height and angle. It matters if you have your own style and uncommon positions. 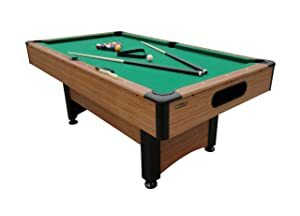 Although standard billiard tables range 7-10 feet long, such kind of size can overwhelm many rec rooms in American houses. Fortunately, this Mizerak Dynasty model is only 6.5 feet long, and it is able to provide all the enjoyment a of traditional pool game. To be precise, its dimensions are 78-inch length, 44-inch width and 32-inch height. The table has rubber cushions which provide a great rebound for accuracy and speed. The pockets are supplied by a 5.5-inch rail system that leads balls to the end of the table for a ball-return, so you can get prepared for the next game in a half minute. Leg-levelers can be considered as a super feature for this amazing table. In case you have a carpeted floor, it allows adjusting each corner of the table and getting a perfect field for the ball-rolling. 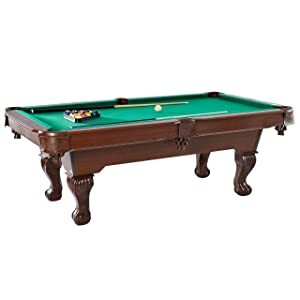 Classic nylon green cloth is a perfect material for this wooden billiard table, as well as for many others. It is quite strong and durable so you may be confident that even through dozen of years after rough family and friends playing its look remains the same. To enhance an exterior the manufacturer used bamboo laminate, and this seems to be a great solution. This Dynasty model comes with a classic set of pool billiard balls with a cue ball. You may be also surprised to findtwo high-quality Mizerak cues, two pieces of cue chalk, a black, plastic triangle, and a special brush for the cloth. As you may guess from its name, this billiard table has 89-inch length. It is a bit larger than the previous model, but still not very big. The width is 50 inches, and you have to consider this before finding a place in your house or garage where a billiard table could be positioned. A model also has leg levelers, which are often very useful. Triumph billiard equipment comes with a wooden bed and plastic claw-feet carved in a tradition design, Drop pockets are made from classic fabric. A playing surface is covered with green nylon cloth. A product package also includes two pool cue sticks, standard billiard balls set, a triangle, a chalk, and a plastic brush. A product was constructed using K-66 specification wood, which is known as a high standard. It is built like a premium quality product and has a pool table look. You will appreciate its classic bumper guards and drop pockets. 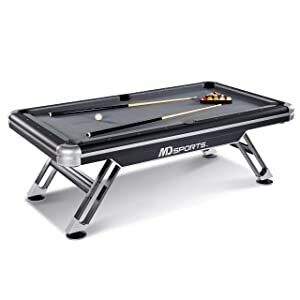 This MD Sports model is 7.5-feet long and is considered to be good billiard equipment for indoor usage. This billiard table is really well-constructed. Its base, along with rails and aprons, are made from reliable medium-density fibreboard. Playfield is made of 18-mm thick laminate felt. When choosing this billiard equipment, you will also get a full accessory kit. All the supplies such as ball set, triangle, brush, two pool sticks and two chalk cubes are included. Additionally, you may find a cloth cover in the package. The Barrington model looks like a standard authentic billiard table with classic pockets, so you can feel like a true pool master when playing on it. It comes 89.5-inch long, 50.25-inch wide and 31-inch high. These dimensions are not small, but if you really want to enrich your home entertainment collection, don’t hesitate and get it in your rec room. Here you can see durable wooden deck support made of 18mm particle board. 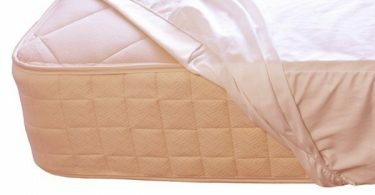 The bed is covered with a bright green woolen felt, which provides right ball-rolling and is easily cleaned. Among included accessories you may find two pool sticks, two chalk cubes, a triangle rack, a cue ball and fifteen numbered billiard balls. 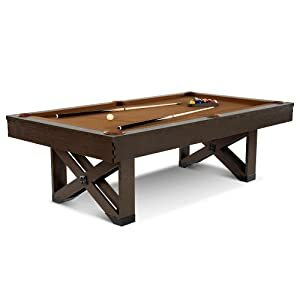 If you have enough space in your house, apartment or garage (16×12 feet at least), this 8-feet (96 inches) billiard equipment would be a great purchase. If you are ok with the size, this could be the best pool table for the money. High-quality and scratch-resistant wood-grain design provides both durability and a stylish look. As an additional bonus, you get original K-818 specification bumper guards for the most comfortable game. Durable 5/8-inch thick wood used for the legs construction along with internal leg supports make this MD Sports table very sturdy and solid. 35-percent wool mixed with polyester felt provides smooth and superconsistent ball-rolling. Leather pockets are one more reason to choose this table. If you have fabric before, you will feel the difference. They come with a beautiful pattern that brings good old classic style directly to your home. With this product, the delivery package should include a standard set of billiard balls, two cue sticks made of solid wood, two chalks, one brush for the cloth and one triangle rack. Crafted for royal playability, this 7.5-feet Fat Cat Reno model provides super-easy assembly and rock-hard stability. Moreover, it resist warping over time. If the words are not enough, be aware that a seven year ‘accuslate surface’ warranty is already included with your purchase of this product. If you don’t want to choose a standard green cloth, than this bold crimson wool-blend cloth is that what you are looking for. Along with beautiful cherry finish and warm oak-toned accent panel, this best value pool table looks polished and expensive. A medium-density fibreboard features smooth surface and gives table a stunning look. 6-inch rails made of wood and K66 rubber bumpers provide this table with outstanding durability that lasts for dozens of years. Shining diamond inlays, red wool cloth and beveled legs with maple wood veneer complete amazing view. Accessories box contains two 57-inches hardwood cue sticks, a rail brush, a set of 2-1/4″ billiard balls, a rubber triangle, and two pieces of chalk. If you are looking for an affordable pool table for your kids, this is s it! It looks like a real billiard table, and, actually, it has no difference except the size. The dimensions are 40 x 20 x 9 inches and its weight is a bit heavier than 20 pounds. So you can easily place this entertainment base in the children’s room. Due to its size, they can get fun and play sitting or lying on the floor. Although this mini-pool-table is produced for children, it abided all the requirements in billiard-table craftsmanship. It has MDF construction, stylish laminate exterior, green woolen cloth and solid-wood cues. 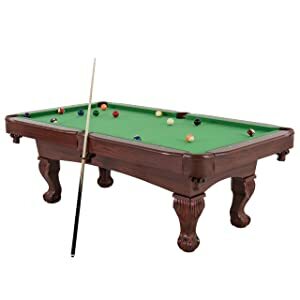 WIth this table also come two 36-inch (3-feet) cues, 15 ball rack, set of standard billiard balls along with cue ball, a chalk and a brush. A legendary American billiard brand, that provided billiard tables to the Texas saloons and mafia bosses’ villages since 1972. Even if it is not true, you can tell your friends it is when inviting them for an exciting game. No doubts, Olhausen looks like it is made for fatcats. Beautifully designed and durable, featuring a special T-NUT rail construction for more precise alignment and larger thread grip, it is perfect for both amateur and professional pool playing. As a bonus you can choose any of ten cloth colors. A premium slate comes as the main material for the bed and legs. A solid tulipwood is covered with matte black finish. Brandywine-colored rails, diamond sides, equal rubber cushions ,and leather shield pockets complete the impression of this best value pool table. In a package you may find a standard set of balls, two solid wood cue sticks, a chalk and a brush. The manufacturer confirms that the delivery and installation will be provided by their representative. If you are interested in high-quality entertainment stuff and developing physical, mental and emotional control, this Barrington model is for you. It has 100-inch length and 56-inch width, so you have to locate it in a quite roomy game zone. This table has an authentic look and claw-leg design, which will considerably improve your rec room interior. Here you may check out durable desk support, which is enhanced with particle board playfield and covered with a green 50% wool felt blend cloth. An item comes with rubber shims, which can help to adjust the level of the table. Besides Hawthorne Barrington Billiard Table, this amazing 22-piece set contains two solid wood cue sticks; two chalk cubes; one triangle rack; fifteen numbered billiard balls; and one cue ball. You can keep it all right on the table. Remember saloons from the Wild West? 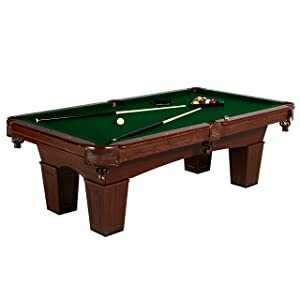 This wonderful billiard table seems to be delivered right from those places. Just look at its 96-inch play field, brown finish and cross-legs design. However, there are a lot of fans who consider such kind of design to be modern. Meet high-quality bed and legs made of MDF wood, produced in North America. Surprisingly the cloth is brown, and, unsurprisingly, is made of wool. The cues are made from solid wood. The legs below are covered with a rubber so you can be confident that your floor won’t be damaged. Among included accessories you will find two cues, a cue rack, a set of billiard balls, one wooden triangle rack, a chalk, and a brush for cleaning the cloth. As you may see from this review there is no big difference between materials and included accessories. In most cases dimensions and design are more important. 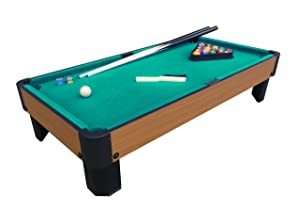 So before choosing the best pool table under $800 or even under $1500, , imagine how would it fit your room and what comfortable playing it offers. How To Pick A Recliner If You Suffer From Back Pain?